Noelle Stevenson’s Nimona was a much loved web comic for many years. Earlier this year it was published as a graphic novel, with an exclusive epilogue, to huge success. The artwork and writing are beautifully executed, unsurprisingly earning Stevenson nominations for categories in both the Eisner and National Book Awards. Sometimes you hear so much about a book that it can become overhyped and you end up disappointed. This is not that book. Nimona exceeds even the highest expectations. It is funny, subversive, heart-warming and unpredictable. Nimona is a shape-shifter who is impulsive and exuberantly mischievous. She convinces Lord Ballister Blackheart to take her on as a side kick in his vendetta against Sir Ambrosius Goldenloin and the Institution of Law Enforcement and Heroics. But things are not as they seem, and their plans don’t always turn out as expected. Nimona and Lord Blackheart find themselves in the middle of a boiling pot. Revolution is in the air. 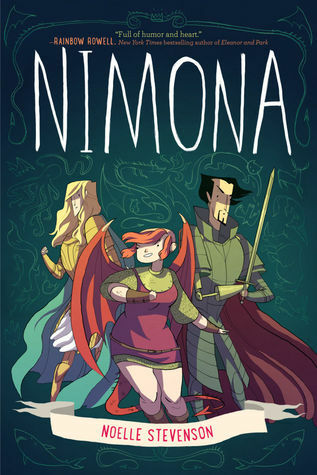 As the story unfolds, Nimona is intent on wreaking havoc and vengeance, Lord Blackheart tries to follow the rules and both struggle to deal with events in their past. The ending totally unexpected and Stevenson deftly intertwines subtle hilarity with deeply touching moments to create a magical adventure story with a whole lot of heart.